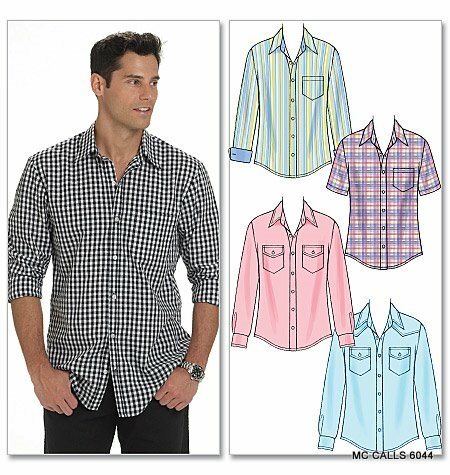 I recently bought a McCalls Mens Shirt Pattern that I will never sew. 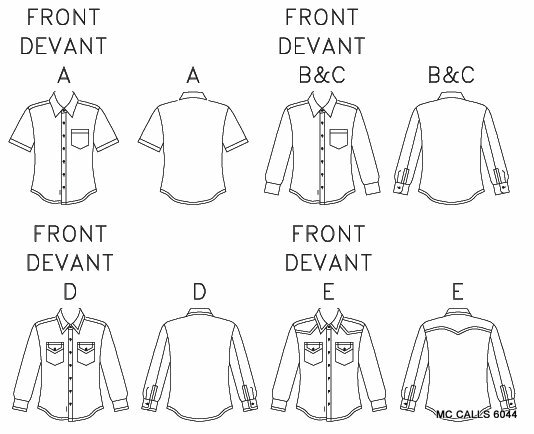 While I hand-draft most of the shirt patterns I use, when a pattern company comes out with a new menswear pattern I usually buy it to see if it has anything interesting to yield. However, if I had taken the time to look at the envelope of this one more closely, I would have put it back in the drawer ! At first glance, it looks like a perfectly "OK" shirt pattern, doesn't it? Silly me...I didn't look closely enough at the front sketch or the back envelope pattern diagrams...which would have kept me from spending my money. Let's take a look at the pattern diagrams, below. I know you are already ahead of me here. Yes, you are correct, this shirt pattern does NOT have a back yoke! The yokes you see in view D and E are merely shaped pieces appliqued onto the front and back. But there is no separate back yoke piece. Well...while omitting the back yoke can be called a design option, in my opinion it is not a good one. A yoke on a man's shirt is quite important because it forms the "foundation" that allows a smooth shoulder line, along with supporting the front and shaping the back of the shirt. A "back" yoke is also important because it is also is part of the "front". 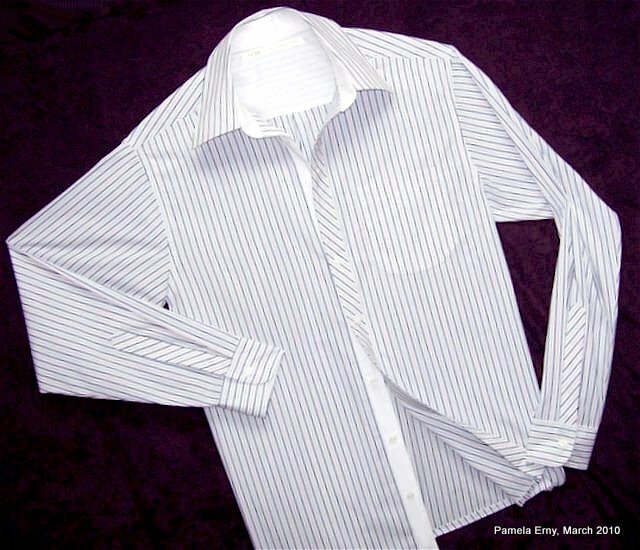 It extends over the natural shoulder-line and that extension becomes part of the shirt front. This extension is important for the front of the shirt to hang straight, to keep the button plackets from "twisting", and to add a touch of support to the pocket so that it doesn't "droop". In my opinion, a back shirt yoke is vital for adding enough ease to lay smoothly over a man's shoulder blades and so that the shirt does not get "hung-up" at the waist or hips. The back can still look smooth, providing this ease without pleats or tucks. 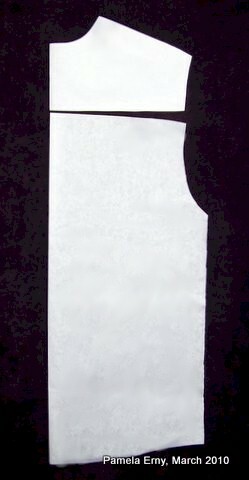 The ease is virtually invisible when the back is drafted with a curved upper edge, and the yoke drafted with a straight bottom edge. The cut fabric pieces are then carefully eased together when sewn. The patterns for a "smooth-but-shaped" back often look something like this, one of my original drafts. This is how you can still have a smooth back with no pleats or gathers, because the ease in incorporated into the curved edge of the upper back. When a menswear shirt is drafted without a back yoke, there is no way to add the necessary ease to glide over the shoulder muscle and shoulder blades, aside from making the back wider at the side seams. When ease is added that way, you often see bunching at the armscye and the upper sleeve..never a good thing. As you can see, I am very opinionated about the importance of a shirt yoke. A shirt yoke needn't be very deep..I often draft them for a finished back depth of only 3", but this shirt-maker thinks every man's shirt needs one ! Judy asked my recommendation for a casual Hawaiian-Style shirt pattern with a back yoke. Men's Islander Shirt Pattern. I've made it a few times, and really like the way it is drafted. Click here to see the one I made from Distressed Silk. Ann asked, "...if a pattern I have doesn't have this [a yoke], is it possible to just cut & draft one from the pattern or is it better to just get out my pattern drafting software and start fresh?" I sincerely regret that I cannot give complete fully detailed lessons on drafting a pattern within the limits of a blog post. Any pattern drafting book will have this information. I took a break from boring business paperwork to sew this shirt for my wonderful husband Roger. He's been seeing shirt after shirt being sent to my clients, so I thought he more than deserves a new shirt too ! 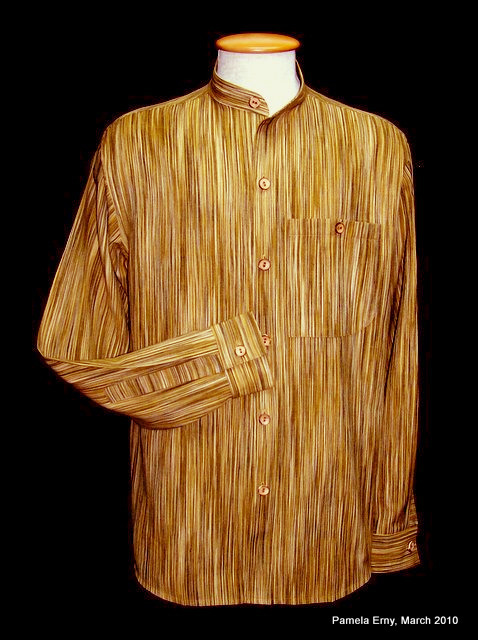 The fabric is wonderfully unusual...a medium weight cotton shirting with highly textured stripes that vary in thickness. This shirt was a huge challenge to photograph, and the photo does not do justice to the beautiful fabric. This menswear shirt is of my original design, and was so much fun to sew because of its mix of design elements. This shirt's main design feature are the contrasting front button plackets. As you can see, the left placket is cut on the bias and the right placket is made from solid white fabric. To complete the 'contrast' design theme of this shirt, the inner yoke, inner cuffs, and collar stand were also cut from the same solid white fabric used on the right placket. Other design features include Curved Edge Cuffs, Bias Sleeve Plackets, and a Rounded Pocket. Oh...just one more thing. If you enjoy my blog, would you please vote for it ? This "Striation Stripe" Shirt is my latest original hand-drafted design, made for one of my favorite clients. 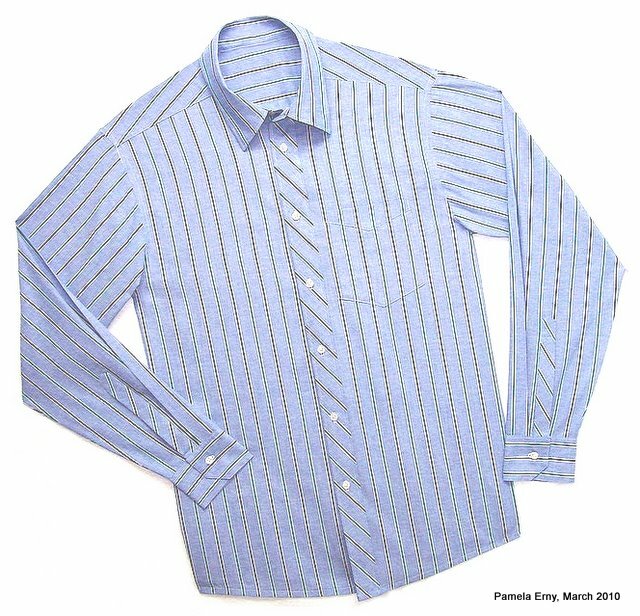 This shirt's design features include a Band Collar, French Front plackets, buttoned "Cigar Pocket", cross-stripe Sleeve Plackets, and Wood buttons.